My go-to recipe for overripe bananas! 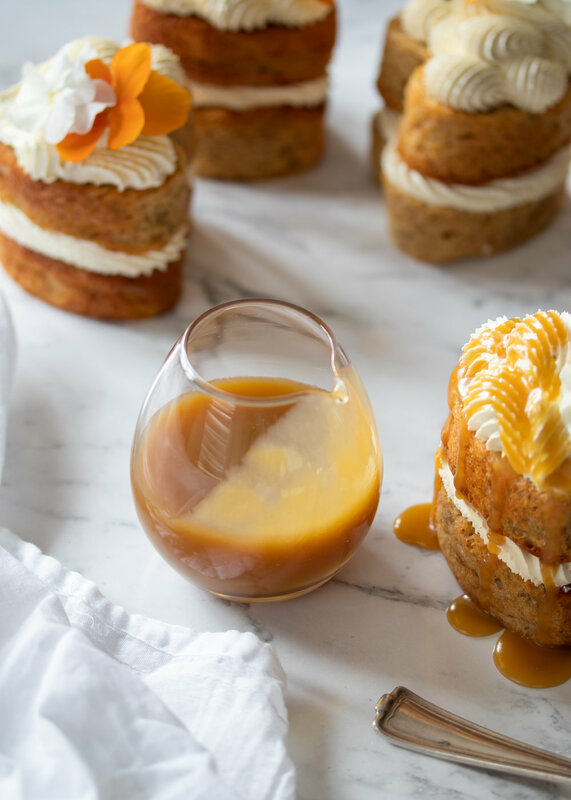 Dressed up for a special occasion with vanilla cream cheese icing and easy-peasy toffee sauce…yes please! For six sandwiched mini cakes, I have used two 6-hole mini heart shaped tins. However, you can use a 12-hole stand muffin tin or mini loaf tin instead or pour the entire batter into a medium loaf tin if you prefer a single loaf cake instead. If you do not have Greek yoghurt on hand, you can use the same weight buttermilk, cow’s milk or almond milk if you prefer. For a no fuss, everyday affair, omit the icing and toffee sauce and lather with butter instead. To start, grease two 6-hole mini cake tins (or one 12-hole muffin tin) with baking spray. In a medium bowl, sieve together the self-raising flour, baking soda, ground cinnamon and salt and set aside. In a larger bowl, whisk the eggs a little using a hand whisk. Add the brown sugar, vanilla bean paste, yoghurt and oil and whisk by hand until smooth. Mash the bananas with a fork then add to the wet ingredient mixture. Mix until uniform. Add the dry ingredients to the wet ingredients and whisk by hand until just combined. Divide the cake batter between the tin holes (about half way full - I use a cookie scoop for this). Bake until golden brown and a skewer inserted in the middle comes out clean (about 15 - 20 minutes depending on your tin sizes). Remove the tins from the oven and turn out the mini cakes. Leave them to cool on a wire rack (covered with a clean tea towel). For the cream cheese icing, soften the butter for a few seconds in the microwave then transfer it to a large mixing bowl. Using an electric beater or electric mixer (use the paddle attachment), beat until smooth. Add the cream cheese, icing sugar (sieved) and vanilla bean paste and beat together for a few minutes until light and fluffy. To make the toffee sauce, combine all the ingredients in a small saucepan. Place it over a medium to high heat and allow the sauce to boil for a minute or two (while whisking occasionally to prevent it from bubbling over). Remove from the heat and allow it to cool to room temperature (the toffee sauce will thicken as it cools). (If they domed in the oven, you can trim off the tops with a sharp bread/cake knife if needed). Using a piping bag fitted with a medium star nozzle, pipe cream cheese icing on one of the mini cakes then sandwich with another. 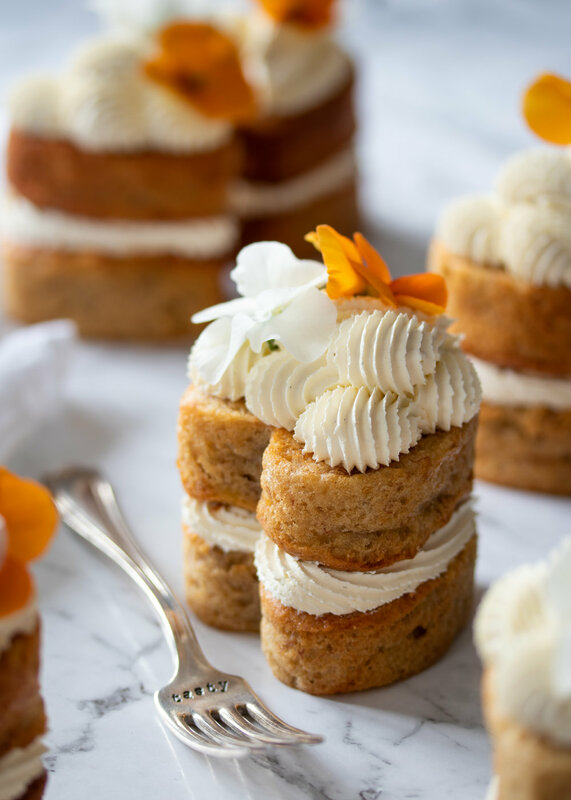 Top each mini cake with a little more cream cheese icing. 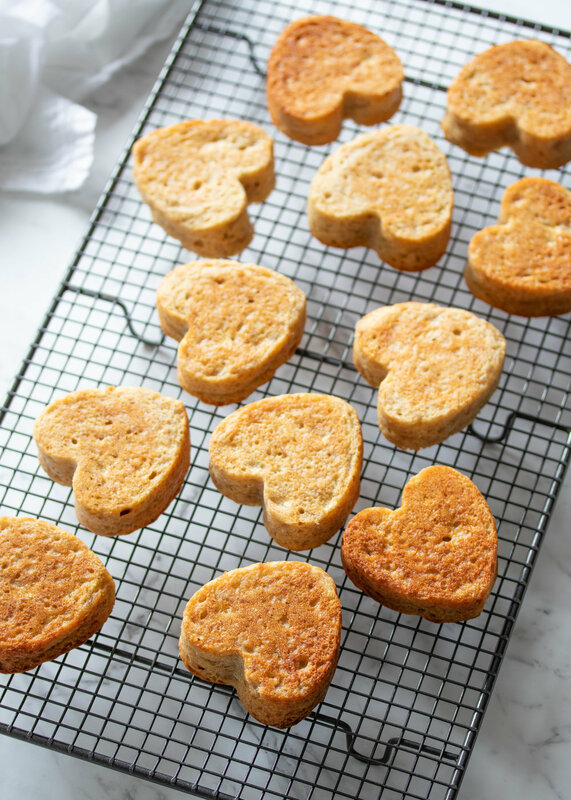 The flavour and texture of these little banana cakes tend to be better the next day. 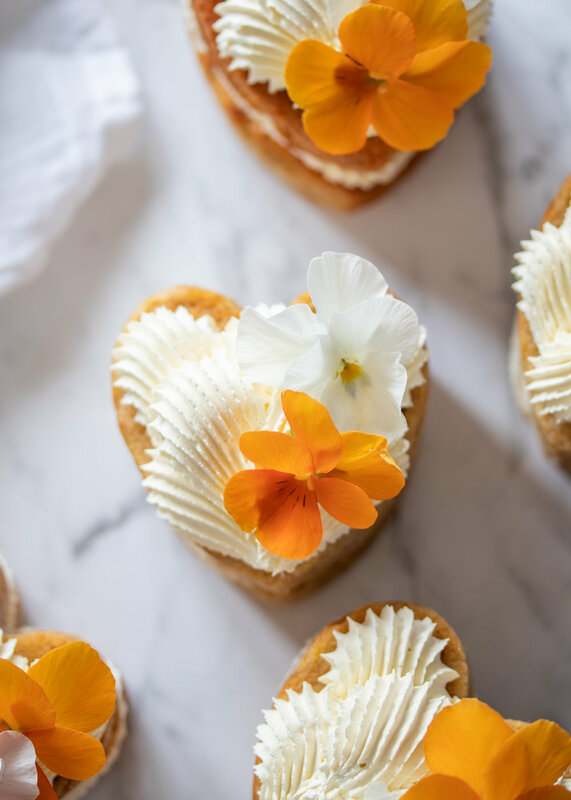 You can keep the piped mini cakes in the fridge in an airtight container overnight and simply decorate with edible flowers if you like the next day before serving. Drizzle with the toffee sauce and enjoy!